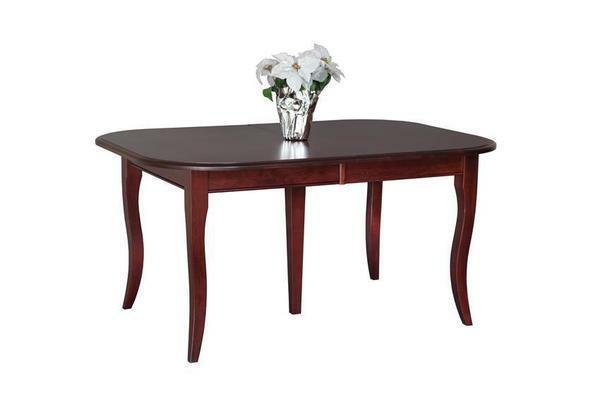 Our Amish Rectangular French Country Dining Table is ready to host your formal dinners, parties and family events! The richness of the premium hardwood you choose is on display here, with perfectly rounded edges and curved and tapered table legs! Choose from Oak, Cherry, Soft Maple & Walnut wood. Additional 12" wide table extensions available. This Amish dining table is handcrafted here in the U.S.A. and we offer a low flat-rate shipping fee! Visit our blog for more ideas and information on dining room styles. Floor to Bottom of Table Skirt: 25"